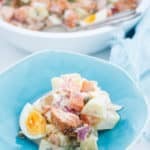 Potato salad is the perfect summer side dish. Adding flakes of wood smoked salmon, capers & dill will make this salad an extra special side or main meal option. Place water in TM bowl, add the internal steam basket with eggs inside. Place the TM lid on with MC Out. Add the Varoma baskets with potato and sweet potato to the lid. Cover Steam 14 min/Varoma/Speed 1. Remove the Varoma basket so as to take out the internal steam basket with the eggs in it. While the potatoes continue cooking, peel the eggs and discard shells. Cut the eggs into quarters and add to the salad serving bowl. Once the potatoes are cooked place them in the salad serving bowl with the eggs and reserve. Drain the water from TM bowl. Add onion, Chop 3sec/Speed 5. Add the onion to the salad serving bowl with potatoes. Roughly flake the salmon fillet and add to the salad serving bowl. Add the garnish dill to the TM bowl. Chop 3 sec/Speed 5. Reserve as a garnish. Without cleaning the TM bowl. Add garlic and peppercorns. Blitz 3 sec/Speed 9. Scrape down the bowl. Add lemon juice, sour cream, and capers liquid. Combine 5 sec/Speed 5. Add capers for dressing. Combine 3 sec/Speed 3. Pour the dressing over the salad and very gently combine. Garnish the salad with capers and the reserved dill. Make sure some egg and salmon can be seen at the top of the salad. This recipe is best made the day before serving as the flavours will combine nicely. If you don't have that much time please note that the salad will need at least 2 hours in the fridge to cool before serving.